EDT Setup and Operation – Welcome to the EMIT Technical Forum! After wiring is completed, install the fuses and turn on both the EIM and the EDT module. Both modules should have the green power LED light up. If it doesn’t, or it is red, check the power wiring. After the EIM boots, the EDT should show up on the home screen. If it doesn’t check the communications wiring and the CAN termination switches. The EDT is generally simple to set up and does not have many settings. See the subsequent section on setting up the system for the ECU that is used. Before setup, make sure you are in a high enough access mode on the EIM. From the EIM Home Screen (System Menu) select the EDT module. From the EDT Home Page, select “Setup”. From the drop down, select ADEM for the mode and hit Submit. No other settings are required. From the drop down, select ESM mode. 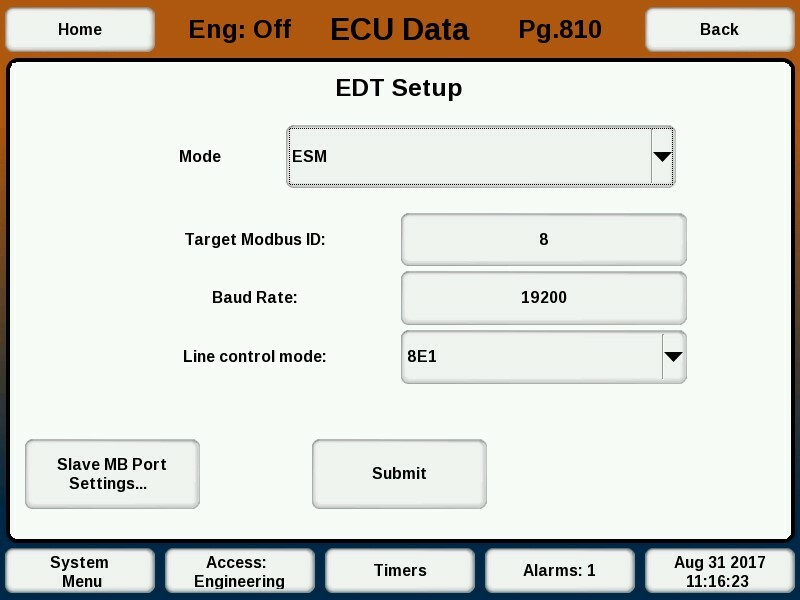 Fill in the port settings and the Modbus ID of the target ESM. If this information is not known, it can be found by connecting to the ESM with the Waukesha ESP software. After confirming the settings, select “Submit”. From the drop down, select “VFD ATV71”. Fill in the port settings and the Modbus ID of the VFD, which can be found from the VFD panel. By default, the VFD Modbus ID is set to 0 on the VFD panel, which has to be changed to another value for the Modbus to be activated. The EDT Home Screen shows the status of the system and the relevant engine data. A screenshot is shown below. The top part of the page shows the status. If the EDT is not receiving data from an ECU, it will show an error here. This could mean an improper setup, or the wiring is not correct. The left side of the screen shows several gauges and an error code lamp. If there are errors, select the error lamp and a popup will list out any error codes. The right side of the screen shows all other engine data that is not a gauge. For some engines, there will be multiple pages of values, in which case the “Up” and “Down” arrows can be used to navigate through the data. 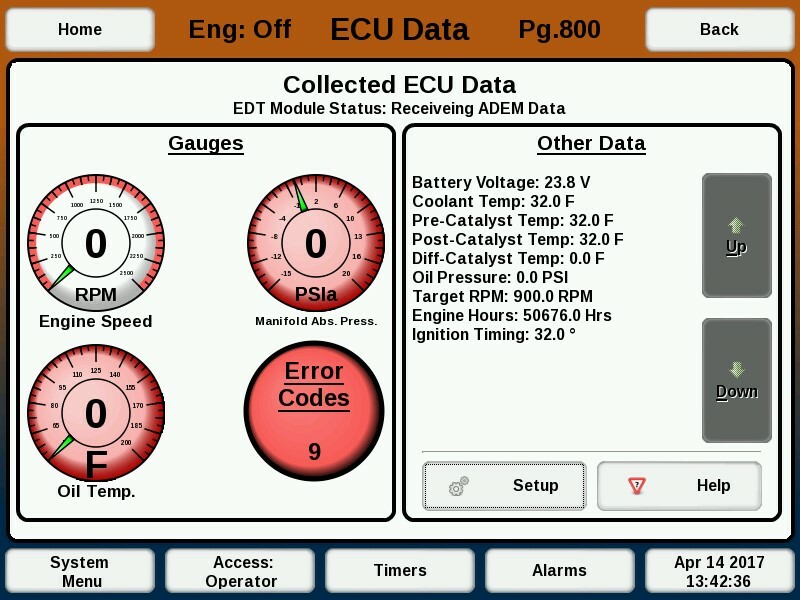 Most ECU data shown on the EDT home screen is logged to the normal EIM datalogs. To view these logs, select “Datalogging” on the EIM home screen. Next, select one of the two sensors and then an EDT sensor on the sensor selection screen. When graphing from the datalog, only items relevant to the current ECU will be shown. To download the datalogs, select “Download Datalogs” on the datalogging screen, insert a USB drive, and follow the instructions on that screen. The datalog can be opened in Excel® or a similar program. A column will be present for all possible EDT sensors, so for any given engine application some of the columns will not be available and will be blank. For example, a single bank engine won’t log right bank items. All data collected by the EDT can also be accessed over the EIM RS-485 Modbus port. See the document “ETS Modbus Tables” to find the EDT Modbus registers. The EDT Modbus table contains all possible values that the EDT can collect. Some values will not be available on all engines- for example, the Waukesha WKI value will not be present on Caterpillar systems. Some other values will be available on all engines, such as engine speed. If a value is not available, the register value will be 65,535 (0xFFFF). Separately, there is a unified Modbus data table shown in the “ETS Modbus Tables” document. This data table has a subset of the engine data, but is in the same place and address for all ETS systems, which makes setting up SCADA systems to multiple varied units easier. It might be preferred in some cases to use this register set instead of the normal EDT register set, though many values are only available on the full EDT register set. For example, register 32006 is engine oil pressure. The EIM will fill this register with the proper data whether it comes from the annunciator, an EDT connected to a Waukesha, or an EDT connected to a Caterpillar. In either case the end user doesn’t have to worry about how the system is laid out- the register will always contain the proper data if it is available.